New Community CEO Richard Rohrman discussed the many years and entities involved in making sure Better Life became the facility it is today. Recovery Center Manager Shareatha Webster welcomes guests to the Better Life Open House. Open House attendees had the opportunity to see one of the upstairs apartments at Better Life. CSPNJ Chief Operating Officer Mark Duffy thanked New Community for the opportunity to provide vital services to the community. 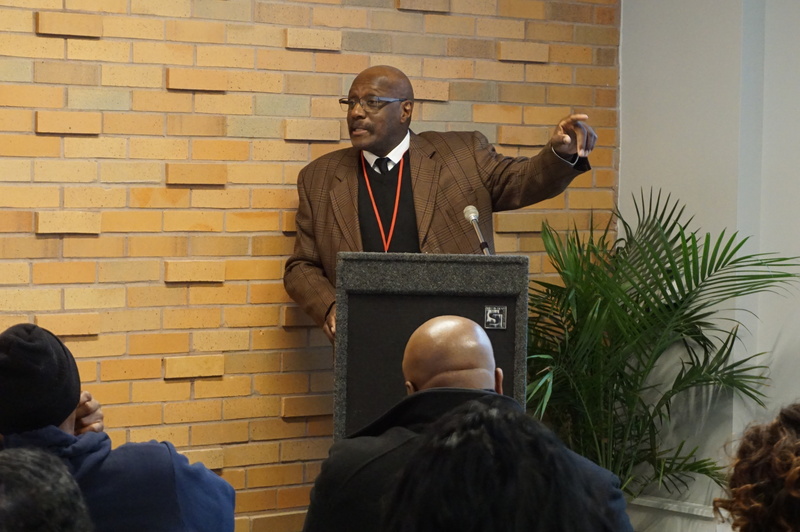 James Shipman of Rutgers UBHC helped ensure all 20 apartments at Better Life were filled. 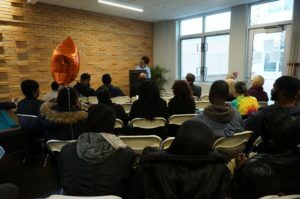 New Community staff members attended the Better Life Open House Nov. 15. 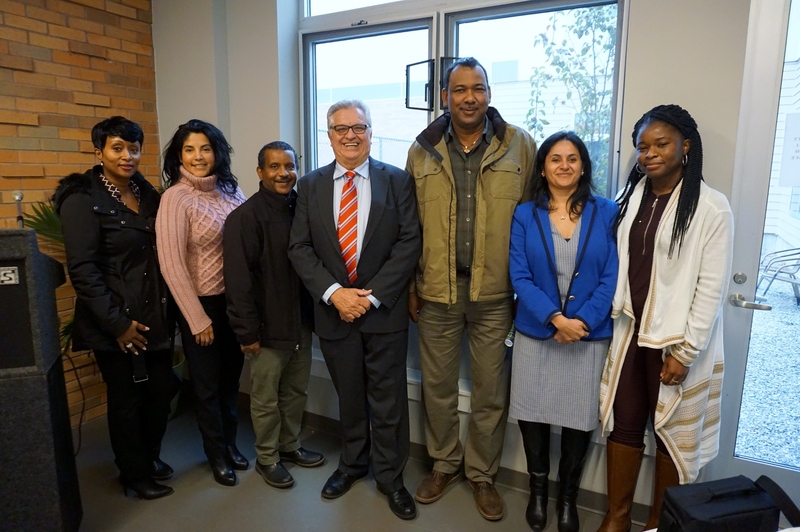 From left to right: Environmental Services Project Manager Ronda Lawrence, Certified Occupancy Specialist Priscilla Ordonez, Asset Manager Sammy Gebreyesus, CEO Richard Rohrman, Environmental Services Director Wayne Gravesande, Chief of Health and Human Services Arti Kakkar and Program Manager Dametria Wertz. Jarell Mann explained to those in attendance how coming to Better Life changed his life. He is a resident and now a staff member at the facility. 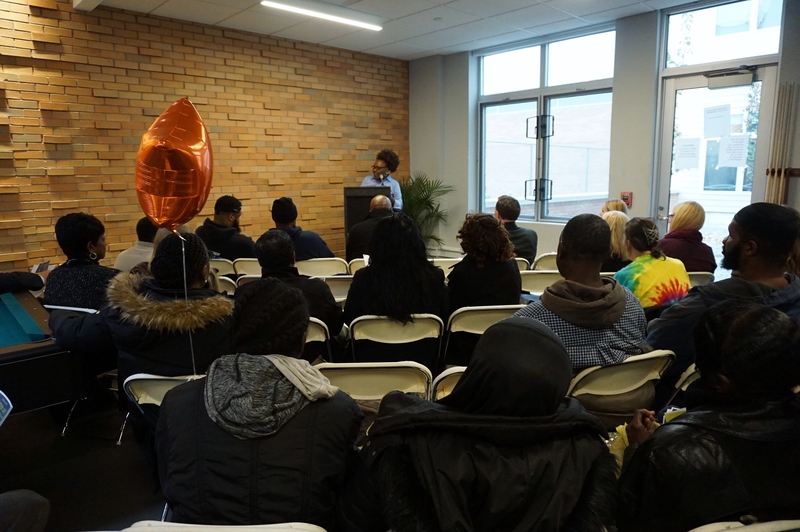 New Community Corporation and Collaborative Support Programs of New Jersey (CSPNJ) hosted an open house at Better Life Nov. 15 to showcase the various programs and services offered to the community. 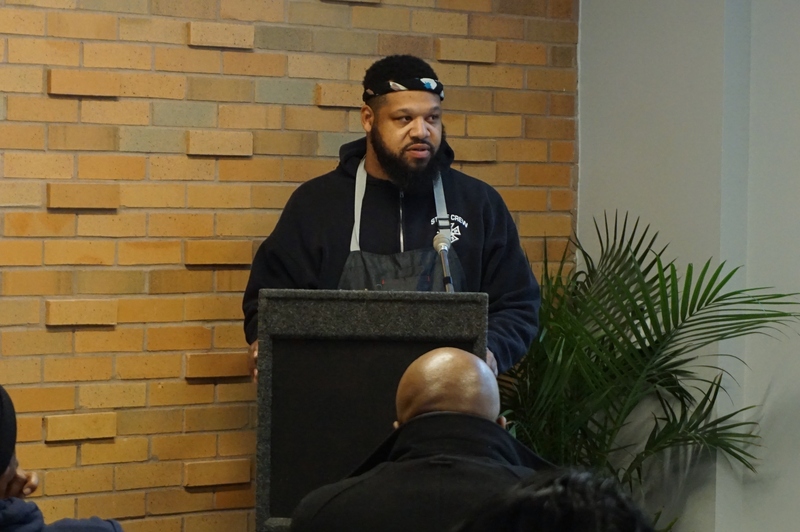 Better Life, which is located at 101 Fourteenth Ave., Newark, has three distinct programs at the location. 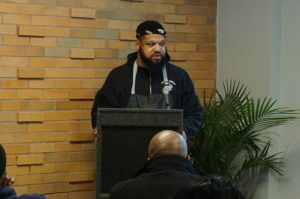 The first floor houses the Better Life Engagement Center, which connects the homeless to services and offers a place for homeless individuals to come for help getting documents, help with a search for permanent housing and jobs, referrals to detox if requested and meals. Also on the first floor is Essex County Wellness Respite Services, which is a hospital diversion program that offers 10-day stays to individuals in crisis who are dealing with mental health or substance abuse issues. CSPNJ runs both programs on the first floor. 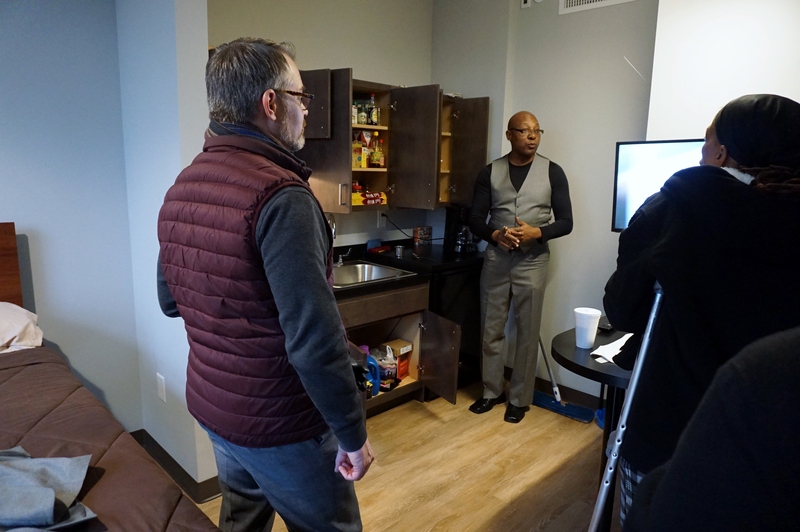 On the second floor of Better Life, there are 20 apartments for formerly chronically homeless individuals. Rutgers University Behavioral Health Care provides the services for those residents, though they also work with CSPNJ and are welcome at the downstairs Engagement Center. New Community Corporation owns and manages Better Life, providing property management, security and maintenance. NCC CEO Richard Rohrman explained that Better Life took 10 years to complete, but it represents great partnerships, both in the construction phase and the services provided. Better Life Recovery Center Manager Shareatha Webster told the open house attendees that the reason for the facility is the vision of New Community Founder Monsignor William J. Linder. 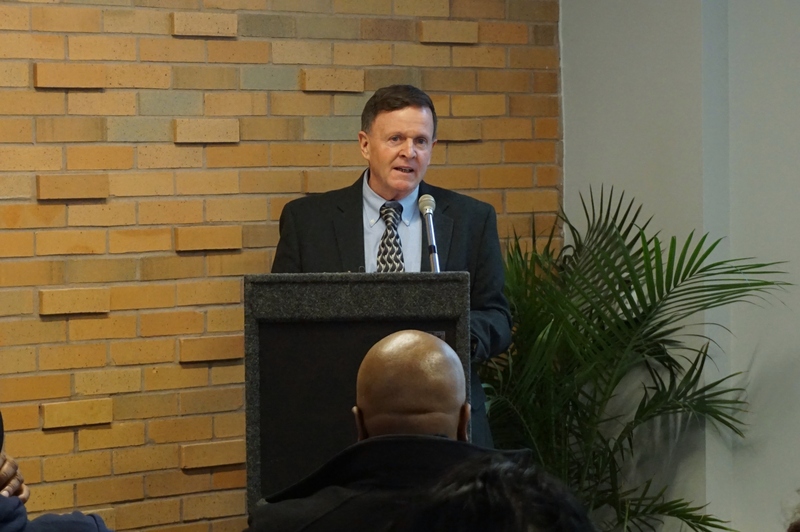 CSPNJ Chief Operating Officer Mark Duffy praised staff members at Better Life and explained that the majority of CSPNJ employees have experience with mental illness, which helps them connect with and better understand those they serve. “Because of New Community Corporation we have this gorgeous building and we have these wonderful partners who come together to produce a very vital service and also a community where people are members of it,” he said. James Shipman of Rutgers UBHC was responsible for filling up the apartments on the second floor of Better Life. 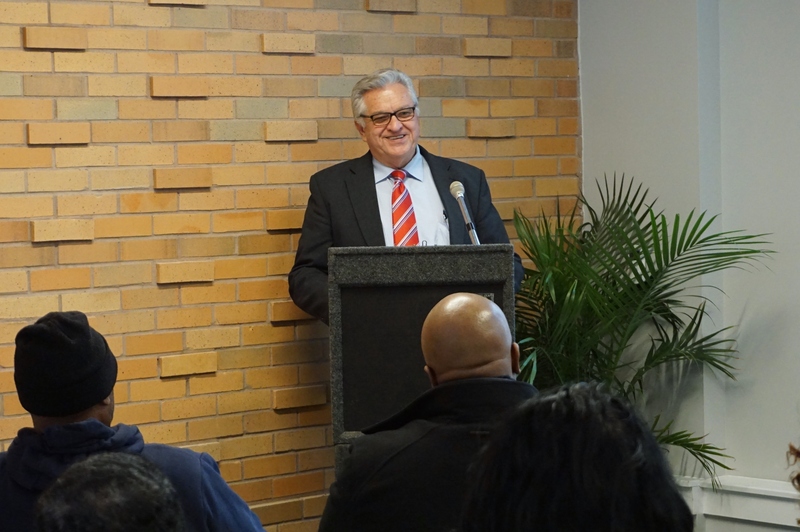 While the need for supportive housing is great, it wasn’t that easy to fulfill all the requirements necessary, which included reviews by Rutgers UBHC, NCC and the Newark Housing Authority. In addition to an apartment, Better Life residents receive support services from Rutgers UBHC. Shipman explained that staff members sit down with each client to develop an individual recovery plan and work with them on their issues. Residents are also encouraged to visit the Engagement Center and utilize the services CSPNJ provides. CSPNJ personnel also helped some residents secure documents they needed during the application process that they were missing. Those who come to Better Life aren’t just getting an apartment, a meal or access to services. They also are able to make connections with people going through similar experiences and they often volunteer their time to help ensure the Engagement Center keeps operating smoothly. Jarell Mann is a resident at Better Life and also a staff member. He shared his story with those at the open house, saying he was lost before entering the facility. When he saw what was happening at the Engagement Center, he decided to give back. Open house attendees were able to tour the Engagement Center, respite area and an apartment on the second floor. They were also able to speak with staff members and ask any questions about operations.